and gets lucky! 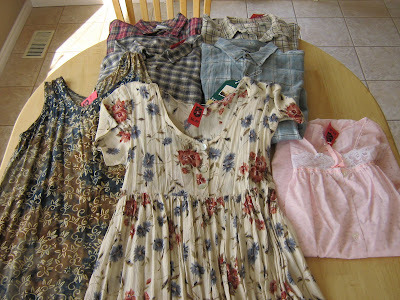 It was the Sally Ann's clearance day sale today so all adult clothes were $1.49. I couldn't think of a better time to pick up some flannel shirts for camping and gardening. I brought an offering to the store (a big bag from my weekend de-cluttering) in hopes that it would change my thrifting luck. I found 4 large men flannel shirts (one with the original tag still on!) that will be perfect for summer - yes, I know I'm weird. I wear big flannel shirts in the summer but they protect my pale skin from burning while I'm outside. I also found some summer jammies and two flow-y summer dresses. All 7 items cost me a little over $10.00! Unfortunately, my son is at an age were it seems to be impossible to find used pants for him. I'm sure all eight year olds have the talent of wearing the knees out of their pants in a record amount of time and I just can't bring myself to pay full price. Good finds on the flannel shirts - good thing K didn't get to them first or she would have them chopped up for quilts. You see, you two just needed the right thrifting attitude - law of attraction, and all that - now any time you go thrifting you will expect to find good deals and you will not be disappointed. You get what you expect in this life ...and it applies to thrifting too. Bet you didn't know that thrifting was such a philosophical thing, did you!! Actually, K was coming out the door with a huge back of shirts just as I arrived so I can only imagine the selection before she got there! Well, you can't accuse me of taking all the shirts - since you obviously found some Samantha ;o) I was amazed at all the good finds today. Pure Bliss! Happy to hear you fared quite well with your treasure hunting too.